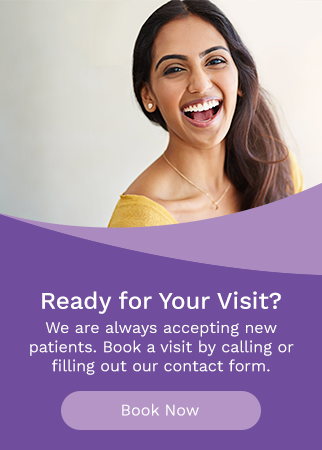 With our range of cosmetic dental services, our Edmonton dentists can enhance and correct your smile! Our Edmonton dentists use bonding treatment to correct teeth that are chipped, cracked, or have gaps. We also use bonding to fill cavities and restore decayed teeth, fix discoloration and change a tooth’s shape, and protect the tooth root from exposure from a receding gum line. Looking for a brighter smile in Edmonton? Riverbend Family Dental Care offers both in-office and take-home whitening kits! It is a process that takes away stains and improves your smile. A crown is a porcelain cover that goes over the tooth that can be used to restore your tooth's shape, appearance and function. Crowns can help patients with many dental situations improve their smile, including broken teeth, large fillings, root canals, cosmetic restoration and functional restoration. Dental veneers are a great option to achieve an aesthetically pleasing smile. They are made of porcelain and attached to the front of the tooth, allowing the dentist to control their shape, colour and position. Very minimal reshaping of the tooth is required and the technology of the porcelain allows the ceramist to make the veneer contact lens-thin. The porcelain veneers are then bonded to the tooth structure, immediately changing the patient's smile. A bridge is a dental structure that helps hold crowns and teeth together. The “traditional bridge” is the most popular type and is usually made of porcelain fused to metal. Bridges usually consist of two crowns that go over two anchoring teeth and are attached to pontics (artificial teeth), filling the gap created by one or more missing teeth.